Join in a celebration of flower gardening! First, pick local fresh flowers from the garden… yours, a friend’s or a neighbor’s – with their permission, of course! Create a breathtaking bouquet & then donate your creation to the Fiesta for a silent auction. 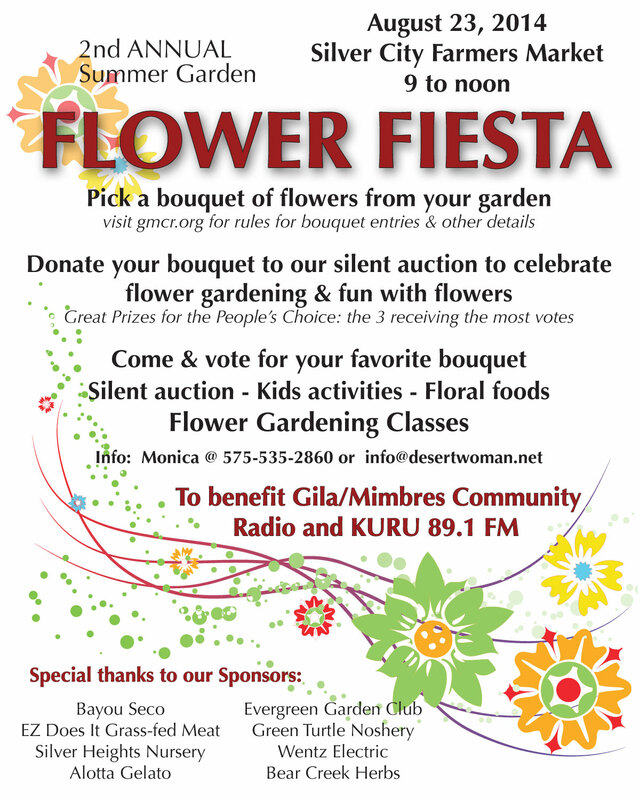 The donation of your bouquet and proceeds from the silent auction will benefit YOUR community Radio station… GMCR / KURU. Whether you donate a bouquet or not, you can stroll among all the entries, pick your favorite and bid on it in the silent auction AND cast your vote for the People’s Choice winners who will all receive prizes. The People’s Choice prizes will be awarded to the 3 bouquets receiving the most votes. Rules for entries & other details below. Last year’s Flower Fiesta was a big success! Check out the slide show here.